For those of you have resolved to keep your wardrobes tidy and organized this year, we’ve just heard that IKEA is offering some great deals on closet organizers and accessories in their Storage Event! Some budget-friendly buys include 20% off PAX wardrobes and KOMPLEMENT interiors. These incredibly flexible wardrobe systems come in all kinds of shapes and sizes so that you can tailor your storage space to suit your individual style. The Storage Event is on at IKEA until February 14, but remember: if you make an eligible purchase before February 1, you can still qualify for the Home Renovation Tax Credit! • Place smaller, compact items into stackable plastic bins to optimize a small space while keeping things tidy and protected not only from water, but also dust and dirt. Clear bins will allow you to see what’s inside each box with ease, such as the SAMLA storage line offered by IKEA. 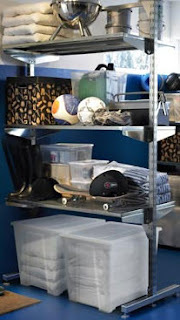 • Items that are used more frequently can be placed on raised, open shelving units for ease of access. The BRODER shelving system by IKEA is a sturdy, freestanding option for awkward spaces where drilling may not be possible. The product is available in different sizes and configurations, but we generally find that the smallest units, such as the 1-section L-foot, work best for condo lockers which are typically on the narrow side. The GORM shelving system is also a customizable, budget-friendly alternative. • Bulkier items can be placed on small wooden pallets or skids, similar to those used by retail stores and warehouses, which will keep them off the ground in case of leaks. Special thanks to one of our readers for sharing their experience with us and inspiring this post! 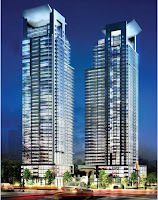 The Livehigh Team recently visited the Sales Centre for Gibson Square. 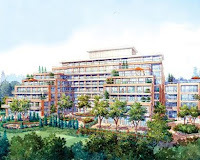 The project will be located in North York, at Yonge St and Park Home Ave, north of Sheppard Ave.
For more details, please click here to access the Gibson Square condo page. a.k.a. Must All Good Things Come To An End? As most of you know, the Government generously offered a temporary incentive for homeowners to undertake new home renovations last year. Since January-end of 2009, Canadians have been benefitting from this Home Renovation Tax Credit (HRTC) for eligible expenditures on work performed or goods acquired. With savings of up to $1,350 on new home reno projects, it's almost a crime not to redo your backsplash with that gorgeous glass subway tile you've been eyeing all year! If you think you're ineligible for this credit just because your home happens to sit 20 levels above ground, you're (fortunately) mistaken! In fact, condo owners may have an additional opportunity to cash in on the credit for renovations made to common areas outside their individual units, as detailed in this great article from yourhome.ca. Sadly - as with all good things - the HRTC initiative must come to an end. There isn’t much time left to take advantage of this great opportunity, so hurry up and revamp that kitchen or bath before February 1! For more information on the HRTC and eligible expenditures, click here. Published in many newspapers worldwide, the latest buzz in the world of high-rises is the Burj Khalifa (formerly called Burj Dubai), now officially the world’s tallest building. 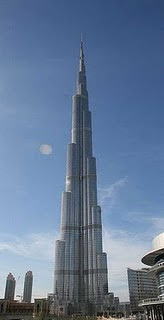 It celebrated its grand opening in Dubai on January 4, 2010. The building is 2,717 ft high, beating former record-holder Taipei 101. With 160 floors of private residences, an Armani hotel and office/retail space, the Burj Khalifa holds a number of world records such as tallest skyscraper, highest outdoor observation deck and tallest service elevator, just to name a few! Amidst Dubai's continued struggle to cope with its massive real esate collapse and the resulting reactions of financial markets around the world, the Burj Khalifa faces criticism and controversy from some journalists and financial commentators for its excessive and unneeded real estate, even cited as a being "vertical ghost town". It's been speculated that much of its real estate was sold over three years ago, bought mostly for investment and will likely go unoccupied for the time being. It's been further noted that the crash will cause a good number of buyers to abandon their deals. What do you think about this? Does the unveiling of the Burj Khalifa symbolize a lifestyle in excess or does it signify a positive uprise in global economies? Click here for a picture of the tower and its surroundings. Click here to see how it compares to some of the world’s tall towers. Click here for a video of the opening ceremony. If you’re a renter, considering a rental or have a unit available for rent in Ontario*, this post is for you! Many people don’t know that in Ontario, there are guidelines that every landlord and tenant must follow when entered into a lease agreement. These guidelines are set out in the Residential Tenancies Act (RTA), which gives residential landlords and tenants specific rights and responsibilities. The Landlord and Tenant Board (LTB) was created by the RTA, and as one of Ontario’s “quasi-judicial” agencies, functions almost like a court of law. The general role of the Board is to resolve disputes between landlords and tenants, regulate rent increases and educate landlords and tenants about their rights and responsibilities under the RTA. Some of these rights and responsibilities may come as a surprise to many landlords or renters. The LTB has a comprehensive website that provides important information for all landlords and tenants, but we’ve highlighted some of the most popular topics covered after the jump. And if you’re looking for a rental unit or have a unit available for lease, please visit our website to view available rentals or post your rental…free!